Mostly cloudy skies this morning will become partly cloudy this afternoon. High 66F. 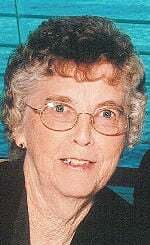 Winds SSW at 10 to 15 mph..
Janesville, WI -- Helen J. Larson, age 89, of Janesville, WI, passed away Sunday, November 11, 2018 at SSM Health St. Mary's Hospital - Madison. Helen was born on the Tangen Farm in Pigeon Township, Trempeleau County, WI, to Palmer and Veda (Tangen) Kaas. She graduated from Whitehall High School. She married Palmer M. Larson on July 30, 1947 in Blair, WI. They moved to Janesville in 1955, and she was employed by Parker Pen Company from 1957 to 1991. She and Palmer also farmed in Center Township near Janesville from 1967 until moving into Janesville in 2002. Helen was a member of Faith Lutheran Church. She enjoyed reading and doing puzzles, but her biggest joy in life was her family, as she was a wonderful wife, mother, grandmother and great-grandmother. Helen is survived by her husband of 71 years, Palmer Larson; three daughters: Virginia (John) Howard of Madison, WI, Patricia (Gregg) Levitt of Vancouver, WA, Donna (Mel) Rohrer of Fort Atkinson, WI; grandchildren: Kelly (Vince) Reindl, Michael (Shelly) Howard, Michael (Laura ) Budd, Gordon (Malia) Levitt, Jeffrey (Kaara) Rohrer, Tracy Modersohn; great-grandchildren: Nick, Josh, Meaghan, Joey, Dylan, CJ, Emily, Evan, Tyson, Alex, Hanna, Kyle; sisters, Elaine Zemple: Audrey Olson, Virgil (Mary) Kaas; brothers-in-law and sisters-in-law, Curt (Mary) Larson and Maryjane (Jack) Kleba; as well as numerous nieces and nephews. In addition to her parents, Helen was preceded in death by an infant son, Jeffrey Alan Larson; and in-laws: Edward Zemple, Lloyd Olson, James and Carol Larson.